Born 1943. Lives and works in Belfast. "A primary function of art is to bridge our mental and physical worlds. Through crass materialism we've reduced art to cultural real estate. 'Actual' creativity can be neither bought nor sold, though it's husks, shells and skins often are. It's possible in art to use meta systems without over-reliance on physical residue and attendant marketplace hustling, jockeying and squabbling." "Art is the demonstrated wish and will 'towards' resolving inner and outer conflict, be it spiritual, religious, political, personal, social, cultural...or any interfusion of these." "As well as ecology of natural environment, there's ecology of mind and spirit, each an integrated aspect of the 'other'. our challenge today is to live this integration. Already we're late. Time we 'have' is not so vital as time we 'make'." Alastair MacLennan. 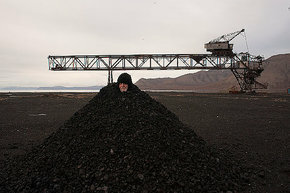 Coal A Goal. Arctic Action. 2015.